Below is Carrie’s story in her own words. Carrie lives in Marysville, Ohio with her parents, forced to move back in with them to help care for her children. Having abandoned any aspirations of a career years ago, she works part-time at Bath and Body Works for a few dollars and some much deserved sanity! Carrie is a single mom. 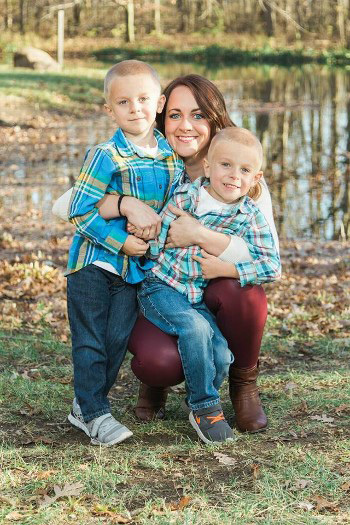 It is Dot’s Tots mission to help Carrie raise $25,000 to make her life – and her boys’ lives – better. Won’t you help? Landon and Logan are the sweetest, most lovable, affectionate, little 5-year-old twins. One smile and they will steal your heart. At first glance, they appear just like any other rambunctious little boys, but their struggles are far greater than you can imagine. Logan has a rare congenital birth defect called Amniotic Band Syndrome; his right arm was banded and never fully developed before he was born, so his arm is amputated from just below the elbow. Furthermore, in 2013, the boys were diagnosed with severe Autism. They not only have difficulty following simple instructions and speaking, they have no sense of danger and are prone to wandering, bolting, and eloping. They will bolt into the street and wander away and not think twice about it. They are brilliant escape artists. There are two of them and only one of me. There is hardly a moment that goes by that I’m not stopping them from doing something that could cause them serious injury. Because of this, it is absolutely imperative Landon and Logan have a service dog. A trained, certified service dog will not only prevent them from wandering and bolting, but can also aid in search and rescue if, God forbid, it is ever necessary, as well as rescue from a drowning. A service dog will also help with socialization and behavior modification. With a service dog, we can finally go to parks and restaurants and stores. The boys could finally attend their friends’ birthday parties and many other things other children get to do that they’ve missed out on for many years. I could go to bed knowing they won’t find a way to leave the house in the middle of the night. This fear is very real and it consumes every moment of every day. We have chosen Service Dogs by Warren Retrievers to provide an Autism Service dog. The cost is $25,000. This not only covers the cost of the dog and initial training, but also years of follow up training and recertification. They will be with us every step of the way in making sure our dog is trained to meet their needs today and for years to come as the boys’ needs change. Accomplishing this goal will not only be life changing for the twins, it could be lifesaving. Until There’s A Cure…There’s A Dog is the Service Dogs by Warren Retrievers’ motto. With hundreds of lives changed and over a decade of dedicated work, SDWR is a leader service dog organization. SDWR believes that through their uniquely trained service dogs, the lives of those with invisible disabilities can be improved. At SDWR, service dogs include Diabetic Alert Dogs, Autism Service Dogs, Seizure Response Dogs, and PTSD Service Dogs. Each type of service dog is hand raised by SDWR staff and volunteers to mold it into a life-saving tool for each family in need.